I’ll be honest. Prior to receiving my screener for Harmontown, I had no idea who Dan Harmon was. I don’t watch Community. I don’t listen to his Harmontown podcast. That doesn’t mean I never will. It just means it hasn’t happened yet. Does that make me a terrible candidate to review this film? Or the perfect one? The way you answer that question might depend on your own familiarity with Harmon’s work. If nothing else, my ignorance allows me to view this documentary as a character study, not entirely different from narratives like The Wrestler or Crazy Heart, without any preconceptions or biases. And Harmon’s character offers more than enough layers to warrant a feature-length film, even if the film itself doesn’t dig far enough past the topsoil to explore its subject’s core. The film opens with a montage of friends and colleagues (including Ben Stiller, Jack Black and Joel McHale) attempting to describe Dan Harmon. Terms like “narcissistic,” “alcoholic,” “self-destructive” and “human hand grenade” are thrown around. The final talking head says, “I think he’d say he’s a writer.” Well I guess that sort of covers it all then, doesn’t it? Now please excuse me while I pour myself another whiskey. Now where were we? Oh, what I learned about Dan Harmon is that he’s regarded as a genius writer, cutting his teeth on The Sarah Silverman Program before launching Community in 2009. He’s also a control freak and extremely outspoken. So Harmon took to another medium to air his frustrations when faced with unsatisfactory ratings and all the politics that come with working for a massive corporation like NBC. For all the filters your work has to go through before it’s seen on a major television network, podcasting is the polar opposite. There might be no more direct way to get your thoughts and words into the ears of an audience than through a podcast. The Harmontown podcast seemed to work as a form of therapy for the frustrated writer, but his mouth also got him into some trouble with NBC, and in 2012 led to his firing from the very show he created. With his newfound free time, Harmon decided to take his podcast on the road with a tour that would bring him even closer to his devoted fans. Community‘s fan base has become a community in and of itself. It’s a community of outcasts and nerds, and these live podcast recordings represent a meet-up for Harmon’s fans to find one another and find that there are others like them. Perhaps more importantly, they can learn that Harmon is indeed one of them — and that one of them can go on to become rich, successful and adored by many, despite all of his considerable flaws. The beauty in Harmon’s show isn’t Harmon himself. 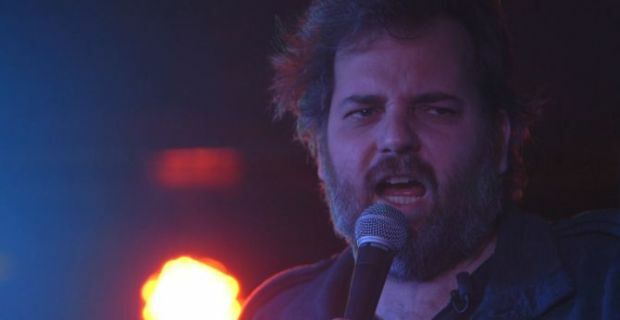 Some of these shows find Harmon belligerently drunk, blacking out, crowd surfing and, well, getting cheered for all of his self-destruction and self-loathing. Harmon paints himself as some sort of rock star, or even a prophet in some instances. But what are we really celebrating? At one point, Harmon and his girlfriend Erin stage a re-enactment of a recent argument in which Harmon called her a c***. Harmon is a 40-year-old teenager who has little to no control over his drinking or his temper. Judging from his fans’ testimonials and their reactions to his jokes, Harmon has a considerable connection with his audience, even if the film struggles to explore this connection in a way that makes it palpable for a viewing audience. At times, he offers them the stage to discuss their own hardships and demons and even brought one fan, Spencer, a Dungeons and Dragons expert of sorts, to join the tour as part of the show. I’m not sure the film manages to fully capture Harmon’s appeal, but the takeaway is that Harmon has the ability to make a lot of people feel good about themselves. Harmontown, in a way, is a comeback story. And when he puts the Harmon worship on hold long enough, director Neil Berkeley paints a fascinating portrait of a gifted writer who has struggled to harness his talents while constantly combating his inner demons. Why does Harmon feel compelled to hurt the people he cares about while hoping for complete strangers to find joy and solace in his work? How is his writing shaped and informed by these traits? Harmontown is a fascinating, yet unfocused documentary about a fascinating, yet flawed individual. I might watch Community someday. Hell, I might even fall in love with it. But as essentially a 100-minute advertisement for Dan Harmon, the person, I’m not sure I fell in love with Harmon the way Harmontown wanted me to.